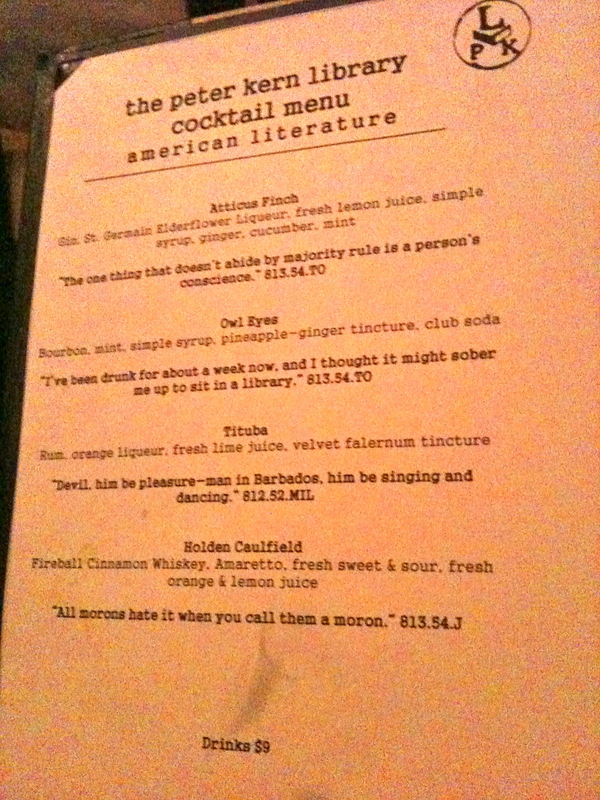 Page one of the cocktail menu at the Peter Kern Library. The quotes are from famous works; the numbers are from the Dewey Decimal System. Maybe I’m an old dog, but at least I’m teachable. –Incredibly, Knoxville is developing a cool downtown scene, complete with speakeasy-type bar. Walk through the lobby of the retro-hip Oliver Hotel to the giant sliding door and peer into the dark room, presided over by fedora-wearing barkeep/DJ/food maven Jessica. The Peter Kern Library (named for the Kern Bakery founder) has a big fake fireplace, glowing like mad even in 80 degree weather, a stuffed fox, weird portrait of an eerie child, and terrific potent potables (the cocktail menu is secreted away in volumes of an old World Book Encylopedia, the one we decided was for people who didn’t like to read). The Siren ($9) is like a combination fresh fruit margarita and sangria, with Espolon Blanco tequila, pinot noir, fresh lime juice, blueberries, blackberries, mint, egg white and blackberry liqueur. On the quiet early side of Sunday night, we asked Jessica if there might be a bite to eat about. She eventually returned with a beautiful plate of Benton’s prosciutto, a friend’s walnut pesto, mustard-seed cheese (o ye of little faith! ), rustic bread, a smear of jam. She doesn’t usually have time — or the storehouse — to put that together, so we suggested perhaps gourmet popcorn, and our friends thought she ought to get in touch with this Maryville popcorn emporium. Loved the Outkast/Cee-Lo groove on the speakers, loved the place, love Jessica. We’ll be back. Especially since the new Gay Street Nama sushi bar has opened, just a couple of blocks away. Our friends also turned us on to Coolato, just down Gay, with amazing house-made gelato. We also want to come back and visit Bistro at the Bijou, just to show our support for the owner’s unwillingness to suffer hating fools. 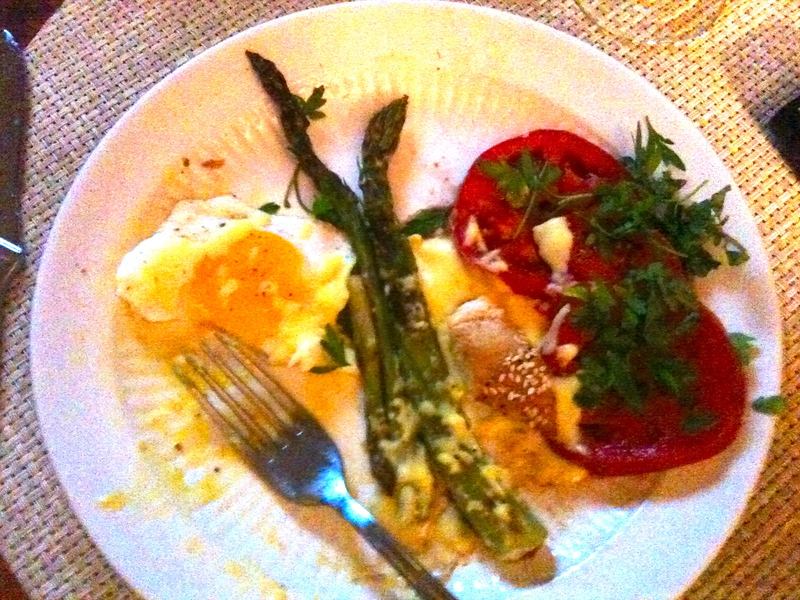 Roasted asparagus with hollandaise, sunny-side-up egg and sliced tomatoes. –If you have a lot of asparagus, you might need more than one recipe. I love it tossed in olive oil and salt, roasted (400 degrees, 10 minutes), with just a little lemon juice. If you have a little more time, holla for hollandaise: This easy method works better than the more complicated recipes I’ve tried. For a small order, just whisk one egg yolk with the juice of a half-lemon in a metal bowl. Melt a couple of tablespoons of butter. Boil some water in a sauce pan, and with the bowl over the boiling water, add the butter in a thin stream, whisking. Take the bowl off the water if the egg starts to scramble. Add a few drops of water if the sauce is too thick. With a fresh, sunny-side up egg, the first Florida field tomatoes of the season and some toasted challah, you’ve got a fabulous supper. –One more: I really want to try this (from a Pinterest post by friend Kathy Trocheck, aka best-selling author Mary Kay Andrews, who exhausts me with her cooking, blogging, decorating, junking and all-around fabulous life). Looking forward to having the gang over for Feaster Sunday, as usual, and somehow it usually feels like we don’t have enough springy green vegetables. This sounds perfect: The Barefoot Contessa’s light mix of snap peas, haricots verts and asparagus. –We love the old-school service and great food at the Orangery in Knoxville. Atlanta no longer has these classic Continental restaurants with beautiful decor (like the old Hedgerose Heights or Pano’s and Paul’s), where it’s fun to dress up. We also love to see the Orangery busy as a result of their clever marketing–even when Tuesday’s $5 kobe beef burger night means the giant, genial dude next to us was wearing overalls. And then had his Discover Card declined. –Ants can bite the devil out of your wrists if you try to remove their home — like, say, a dead plant — from your garden. –Apparently you don’t have to be bitten by a zombie to become one, if you’re infected by the zombie virus. (From last week’s Walking Dead.) I hope there are no zombie ants, because I could have a very ugly wakeup call. Welcome back! Holla for the challa and thanks for the Hollandaise.